As the Silicon Valley storms ahead, trailblazing as the world's technology center, critics say one group is being left behind. The Hispanic Foundation of Silicon Valley says Latinos make up only 3 percent of the high-tech employees in the Valley. Now the foundation is doing something about it. 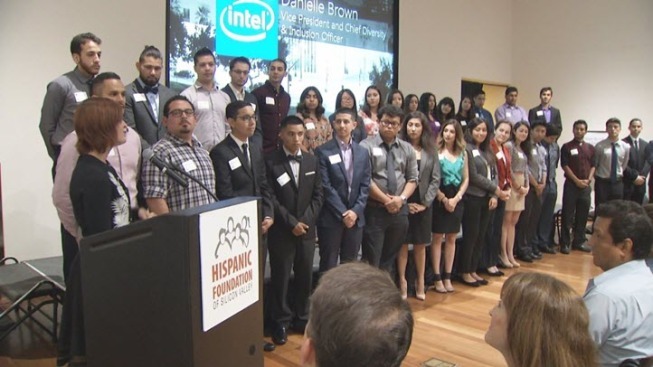 The foundation recently awarded 47 students the Latinos in Technology scholarship. The goal is to award up to 100 scholarships annually for five years to Latino students who choose a major in science, technology, engineering or math (STEM). The scholarships are a full ride and funded by companies like Intel, Symantec and Netflix. "There are people who are putting their money where the problem is," said Ron Gonzales, Hispanic Foundation of Silicon Valley CEO. "And they're putting it on a solution that's local and where we'll see results within a couple years." Latinos make up nearly 30 percent of the population of Silicon Valley, but only about 3 percent of the high-tech workforce. "When I got the scholarship I was really excited," said Mara Leandro, one of the students who received a scholarship. After two years at a junior college, Leandro is headed to San Jose State University thanks to the scholarship. She plans on studying mechanical engineering. "The program gets local kids from our own neighborhoods," Gonzalez said. "These are young men and women who are in college now trying to get a STEM-related degree so they can get a job in high tech." The students will also get internships in high tech -- all bankrolled by companies aiming to diversify their Silicon Valley workforce.